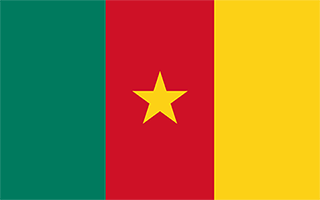 Cameroon with its capital Yaounde is located in Africa (Central Africa, bordering the Bight of Biafra). It covers some 475,441 square kilometers (slightly larger than California) with a population of 24,994,900. English and French are the languages spoken by people in Cameroon. Central African Republic, Chad, Equatorial Guinea, Gabon, Nigeria and Republic of the Congo are bordering countries. Cameroon is in West Africa. Cameroon is a diverse and multi ethnic country. While it is not the largest country in Africa, in some ways it's as large as Africa itself. Known as Africa in miniature it features French and English speaking portions, Muslim and Christian dominated regions, the tallest mountain in West Africa and terrain that includes rain forest, desert plains, mountains and high plateau. If you are going during the summer, plan on lots of rain every day. It might be cold up in the mountains, especially at nights. Most people will need a visa and it is very advisable to obtain it before arriving. French and English are the official languages in Cameroon although there are over 276 recognized languages in Cameroon. The Northwest and Southwest provinces are anglophone although in some areas pidgin English is more common. The rest of the country is predominantly francophone although almost all areas will also have local languages. To reach someone Cameroon dial +237 prior to a number. The local cellular networks are operated on 900 MHz, 1800 MHz, 3G, 4G. Websites typically end with the top level domain ".cm". If you want to bring electric appliances (e.g. battery chaarger), keep in min the local 220 V - 50 Hz (plugs: C, E). The sign for the locally used currency Franc is XAF. Three equal vertical bands of green (hoist side), red, and yellow, with a yellow five-pointed star centered in the red band; the vertical tricolor recalls the flag of France; red symbolizes unity, yellow the sun, happiness, and the savannahs in the north, and green hope and the forests in the south; the star is referred to as the "star of unity".